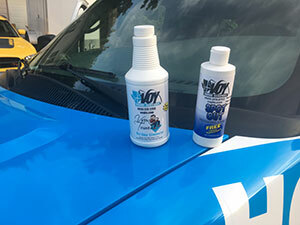 Label reads: "FREE Lifetime Replacement"
At only $1.48 per bottle, 8-ounce Giveaway Spot Out is the most cost effective way to create the high profitability of repeat and referral customers. The custom designed label features a large area where your company's marketing message (your name, phone number website, logo, slogan, or a custom coupon) is printed in black and white. This crisp marketing message will maximize your impact with your customers and create repeat and referral business from the very first bottle. All you have to do is present your customer with a bottle of Spot Out at the end of the job. Take a moment to explain the easy directions for use and thank them for their business. If you want even more repeat and referral business, you can do what so many of our top Spot Out customers do: give a bottle to each potential customer when you do your estimate. It's a very effective way of getting the "in" for the job. Another trick is to give two bottles away after each job and ask the customer to pass one along to a family member, coworker, or friend. The only limit to the power of this powerhouse program is your imagination! What will you do with your Spot Out? It's easy to get started with Spot Out. Simply add 4 cases to your cart or call 1.800.556.6366 and ask to speak to a Spot Out Representative. It only requires a four-case (96 bottles) minimum purchase to get the ball rolling and your profits rising. We will ship your Spot Out to you within 72 hours of confirming your customization. And remember, Spot Out is backed by the industry's strongest guarantee: Jon-Don's 100% No-Hassle Money-Back Guarantee! If you're not happy with the product for any reason, we will happily refund all your money, no questions asked.